What is the effect of mattress dumping on the American market? No, this isn’t a campaign for a trash-free countryside. The site of unwanted dumping is not roadsides and vacant lots, but the North American mattress market. More than an issue for one business segment, this is an issue of national security, especially national economic security. For those who do not know what dumping is, it is flooding the market with products being sold for less than the cost of manufacturing for the purpose of overwhelming the competition. It was a tactic used in the 1800s by companies who could afford to take the loss for a while to bankrupt their competitors and establish a monopoly. Mattress dumping did not become a serious issue in the U.S. mattress market until after the explosion of the boxed bed trend in 2014. The first disruptor start-ups – Tuft & Needle, Casper, and Yogabed – and those who immediately followed were domestic producers: they made their mattresses in the United States. There were also Canadian companies, such as Essentia, making their mattresses in Canada, meaning that North American manufacturers were supplying the North American market. Most mattress-in-a-box models have been memory foam mattresses, because they were the best candidates for compression and rolling for packing into boxes. Latex mattresses are also good candidates for this process, and the original Casper Mattress was a latex-memory foam hybrid. Since then, innerspring mattresses and coil-foam hybrid mattresses are also being rolled and boxed. Memory foam has fundamentally changed the mattress market since memory foam mattresses were first introduced in 1991. Until then, almost all mattresses sold commercially had innersprings. Several kinds of springs had been invented to improve support, durability, and pressure relief: Bonnell Coils, offset coils, continuous coils, and pocket coils. About 20 years before memory foam mattresses, waterbeds became popular for their pressure relief. Not long after, Comfortaire introduced adjustable airbeds for permanent bedroom use. Memory foam mattresses soon eclipsed waterbeds, then began to challenge the dominance of innerspring mattresses. However, memory foam was more expensive than springs and polyurethane foam, making memory foam mattresses themselves quite expensive. TEMPUR-Pedic, the original manufacturer of memory foam mattresses, is known for its high prices. A major goal of the founders of Tuft & Needle, Yogabed, and Casper was to make mattresses more affordable. 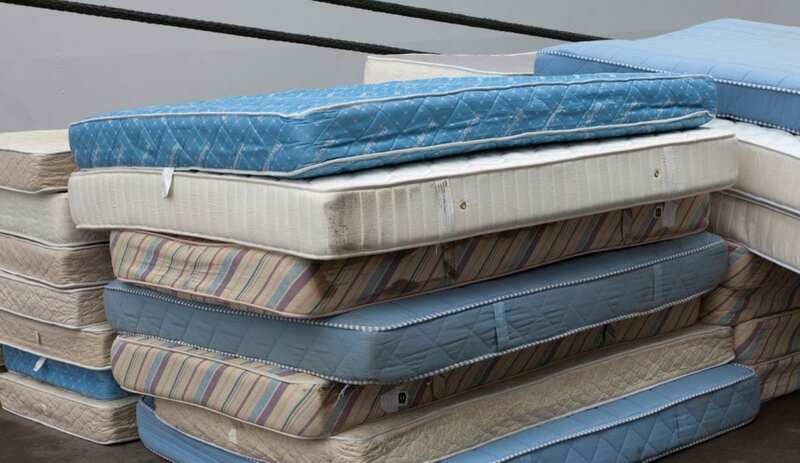 Even with their lower prices for all-foam mattresses, they were more expensive than many innerspring mattresses, such as Serta’s continuous coil models sold in many retail stores. Hybrid mattresses with innerspring support cores and memory foam comfort layers offered memory foam comfort at a lower cost, since springs are price-competitive with high-density, high-resiliency polyurethane foam. Hybrids are intermediate in price between all-foam memory foam mattresses and innerspring mattresses, unless they are luxury models. The boxed-bed trend introduced a cost reduction race, with newer competitors vying to undersell the original online brands, then the established manufacturers trying to match the newcomers. Despite problems with production in China, lower cost was a magnet. A number of companies, such as Zinus, were established in the United States with direct ties to Sino manufacturers. A few of them are even owned, in part or in whole, by Chinese firms. Some U.S. companies, such as Boyd Sleep, have switched from domestic memory foam to memory foam from China for assembling mattresses here. Much of the lower cost of Chinese manufacturing is cheaper labor. But that is not all. The government in China subsidizes many products, including memory foam and mattresses, so they can be exported to North America at less than the cost of manufacturing. The only logical reason is to gain an unfair advantage over North American made memory foam and mattresses. In other words, they are dumping mattresses on the U.S and Canada. By now, their manufacturing is well-enough established that there is no need to artificially lower the price for reasons of introducing a product. According to World Trade Organization standards, this is an unfair trade practice if it significantly damages domestic industry. That is the basis of the claims by several U.S. manufacturers of mattresses, foam, and other mattress components. At the heart of this issue is not only fair play in the marketplace, but quality and safety. Our markets are being flooded with inferior quality products, including memory foam mattresses, which are being dumped on the market. China has not been famous for the quality of its products, including memory foam, but notorious for poor quality, even raising concerns about safety and health. Reading memory foam mattresses reviews by customers reveals a number of issues with Made in China memory foam. One is durability. Many mattress owners report that Chinese-made foam begins to sag, lose support, and break down sooner than domestic foam. In response, many U.S. designers and manufacturers have chosen to use domestically produced foam. The additional cost is justified, since failing mattresses increase the cost of honoring warranties. Minor imperfections, such as misfit of layers to each other, were named in some earlier reviews, but sizing has become more consistent, probably through either refining the manufacturing process or bringing the foam here to cut and assemble. A major issue is emissions (also called outgassing). Although many brands made in China claim certification by OEKO-TEX and CertiPUR-US, they still generate complaints about odors, more than for domestic memory foam. In contrast, memory foam mattresses by Tempflow, a subsidiary of Selectabed, use domestically made Biogreen Memory Foam, which has only ¹/₁₃ the CertiPur-US standard for allowable Volatile Organic Compounds. As far as safety is concerned, Chinese goods should be continually and consistently tested for content. Chinese industry does not have a good record on quality control, even when it comes to product safety. On the contrary, there have been problems with harmful impurities. For instance, several years ago pet foods exported from China contained melanin, which was added to increase the tested level for protein. Melanin gives a false reading for protein, and this deceit killed many pets. Close to this time, many Chinese infants died from drinking formula tainted with melanin. Another example is Chinese made vinyl products, which have had a reputation for horrible odors, some resembling skunk oil, which come from improper or incomplete curing of the vinyl. Since memory foam, polyurethane foam, synthetic latex, synthetic fibers (used in covers, liners, and batting), and hard plastic parts are made by combining precise proportions of chemicals and precise processing and curing, and manufacturers there have a spotty quality record on this score, it seems that we are taking a chance with quality and safety by importing these materials. In fact, some manufacturers have returned manufacturing to America for that very reason. Hopefully, these developments will not only correct the imbalance of trade, but improve the overall quality and safety of our memory foam mattresses with more memory foam made in the USA instead of made in China. Tim Ahmann (Reporter), Susan Heavey (Writer), Doina Chiacu and Marguerita Choy (Editors), “U.S. opens anti-dumping probe on Chinese mattresses after complaints,” Reuters, October 12, 2018, 10:46 AM, https://www.reuters.com/article/us-usa-mattresses-china/u-s-opens-anti-dumping-probe-on-chinese-mattresses-after-complaints-idUSKCN1MM1XZ. BedTimes News Desk, “ITC Releases Preliminary Injury Determination and Report in China Mattress Antidumping Case,” BedTimes Magazine, November 28, 2018, https://bedtimesmagazine.com/2018/11/itc-releases-preliminary-injury-determination-and-report-in-china-mattress-antidumping-case/. U.S. International Trade Commission, “Mattresses from China, Investigation No. 731-TA-1424,” November 2018, https://www.sleepproducts.org/wp-content/uploads/Mattresses-Publication-No.-4842.pdf. Julie A. Palm, “2019 Bedding Outlook,” BedTimes Magazine, December 5, 2018, https://bedtimesmagazine.com/2018/12/2019-bedding-outlook/.